The mobile broadband technology used on the Dell Wireless 5540 HSPA Mobile Broadband Mini-Card are High Speed Data Packet Access (HSDPA), Wideband Code-Division Multiple Access (WCDMA), Enhanced Data GSM Environment (EDGE), General Packet Radio Service (GPRS), and Global System for Mobile (GSM). Both HSDPA and WCDMA are considered third-generation (3G) technologies. 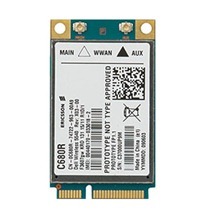 Note: *** The aboved driver & application also apply to Dell Wireless 5541 HSPA Mini-Card, Dell Wireless 5542 HSPA Mini-Card.